The benefits of diatomic molecular hydrogen-infused water are clear, and are covered in this article. Electric water ionizers are the most proven and convenient way to create diatomic molecular hydrogen – H2 dissolved in water and have a 30+ year track record of improvements/ patents in this regard. An electric water ionizer, as a flow through device, produces molecular hydrogen H2 water on-demand; you turn it on and you can instantly enjoy molecular hydrogen H2 water at the ionized alkaline level you enjoy and select. Electric water ionizers also offer other benefits such as alkaline ionized water or acidic ionized water, with selectable controls that enable you to use the water in various “functional” ways. One added benefit is that, in the water ionization /electrolysis process, the levels of fluoride ions and chemical compounds such as nitrates, phosphates and cyanide are reduced as they get attracted towards the acid water side. AlkaViva has test results from the University of Nevada at Reno documenting this benefit. Electric water ionizers are the only method for generating diatomic molecular hydrogen – or H2 water that carry approval as a health devices (Japan and Korean governments). All AlkaViva electric water ionizers employ a patented technology that reverses the polarity of electrodes with every use, ensuring the electrode plates are maintained in a pristine condition and preserving their ability to generate therapeutic levels of diatomic molecular hydrogen – or H2 water. AlkaViva also offers the only USA-made water filters which were shown to reduce virtually all contaminants to 99.9% in EPA-certified lab testing. Electric water ionizers, however, are not affordable for everyone or practical in all situations and there exist more affordable options. These electric moleclar hydrogen H2 water generators are designed to create dissolved molecular hydrogen H2 in neutral pH water. Until they are tested extensively in the market over time, their durability remains unproven but a definite plus is that they can make good levels of diatomic molecular hydrogen water. 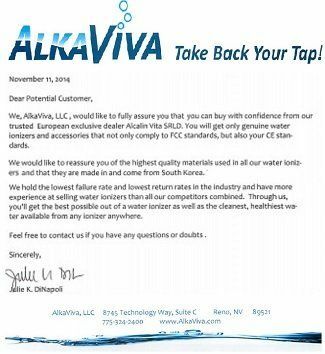 AlkaViva is now also importing their own molecular hydrogen H2 water generators and will be carefully observing performance and reliability over time, since unlike Korea or Japan, there is such a wide range in water quality and conditions in the USA which impact long-term performance in regards to H2 infusion /generating diatomic molecular hydrogen water. We will be recommending UltraWater filter pre-treatment because the two standard water filters (carbon and .01m water filters) are produced in Asia and while they offer a good reduction of microorganisms, offer limited water contaminant reduction. The best diatomic molecular hydrogen water generators are flow through devices like electric water ionizers. Cheaper models are inconvenient, requiring you to pour a limited amount of water into a container and then wait while molecular hydrogen is infused into the water. These models also do not usually filter the water. There are healing natural water springs around the world. Among them, are places like Nordenau (Germany), Tlacote (Mexico) and Hita Tenryosui, Japan. Research has documented that these waters contain dissolved molecular hydrogen1-3 along with alkaline minerals. These water springs get their healing characteristics through contact with natural alkaline earth metals and minerals. It is important to note that the molecular hydrogen level in water from the best natural healing spring is well below the molecular hydrogen H2 water level possible from an average electric water ionizer. If quality water filters are used in non-electric water ionizers, then contaminants will be removed while helpful minerals are allowed to pass through. This makes a clean, mineralized healthy water that is designed to imitate nature’s healing springs. Unfortunately, today’s tap water is nothing like the water from natural springs. It often contains a host of chemicals, heavy metals, pharmaceuticals, and other toxic substances, and it is an oxidizing agent. Most countertop units that produce molecular hydrogen H2 water do not address the tap water contamination issue. Their water filters remove or reduce chlorine and some other contaminants (but not all). One countertop filter stands out in regard to its water filtration capability. The Elita CT700 from AlkaViva not only makes diatomic molecular hydrogen water but also creates very clean, alkaline, ionized water. The Elita CT700 from AlkaViva incorporates proprietary USA-made UltraWater filtration technology. Independent, USA EPA, certified laboratory testing confirms that up to 99.9% of virtually all tap water contaminants (a total of 172 were tested) are removed with the UltraWater filtration technology. No other non-electric ionizer has been tested for so many contaminants or tested using independent EPA testing methology. What is significant about any non-electric countertop water ionizers is that they will give filtered, alkaline pH and ionized water on-demand. Equally significant is that they will NOT necessarily produce significant levels of molecular hydrogen H2 on-demand. This is because the amount of molecular hydrogen H2 water produced depends on how long the water stays in the water filter between uses. Reason is magnesium in these water filters requires a certain amount of contact time with water before it can transform into molecular hydrogen H2. Once you have poured a continuous stream of water or completed a few start and stops, from filling glasses or containers, the molecular hydrogen H2 water production falls off significantly. The level of molecular hydrogen H2 will ALWAYS be highest when the non electric water ionizer has been sitting for a period of time so that the water in it and magnesium can react – the longer the better – just like a stick. Another way of producing molecular hydrogen H2 water is from metallic magnesium in the form of tablets or powders. There are a number of these products on the market today. Some are formulated to dissolve in water, producing the molecular hydrogen H2 reaction in a container before you consume the molecular hydrogen water . Others are formulated to be ingested – with the molecular hydrogen H2 being produced in the stomach. Since these products consist mainly of a special form of magnesium – a mineral that most of us are lacking in the diet – it’s normally both safe and beneficial to ingest. The preferred method to make molecular hydrogen water is to use a tablet that dissolves in water. Why? Molecular hydrogen H2 saturation levels can easily be tested and documented. Using Molecular Hydrogen H2 reagent drops, you can measure the amount of molecular hydrogen H2 produced.4 Testing is impossible when tablets or powders are ingested. Also, the beneficial research results that have been achieved from ingesting molecular hydrogen H2 have mainly come from studies where subjects consumed dissolved molecular hydrogen H2 in water. Tablets create molecular hydrogen H2 water in approximately 20 minutes. Drop the tablet into an airtight bottle of water, and you’ll see the molecular hydrogen gas bubbles immediately form, infusing it with the powerful health properties of molecular hydrogen H2. In fact, such tablets currently produce the most potent concentration of molecular hydrogen H2 water. Everyone is different when it comes to taste, and some people report that various versions of the molecular hydrogen H2 generating tablets if magnesium have an unpleasant taste. You can add lemon juice or other flavoring without affecting the molecular hydrogen H2 concentration. While it is true that molecular hydrogen H2 producing tablets dissolved in water can make very high levels of molecular hydrogen H2 saturation, it is equally true that inconsistent performance is a real problem. Molecular hydrogen is the smallest element occupying the first position on the periodic table. Molecular hydrogen is similarly the smallest molecule – and it’s a gas. molecular hydrogen wants to escape and will if not prepared in the right type of container. If the container is not completely airtight, filled all the way to the top, capped tightly and then allowed to sit for the correct amount of time, you will have wildly inconsistent results. If the preparation is botched it is entirely possible to have no molecular hydrogen H2 in the water. 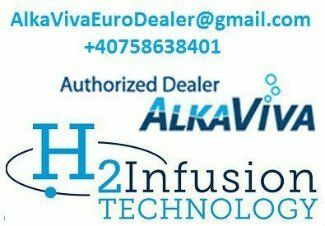 AlkaViva’s H2Viva is a molecular hydrogen H2 tablet product that you dissolve in water and that has been verified to produce a consistent saturation level up to twice the amount or more than that of a new hydrogen stick and will do so in half the time. These are stronger, faster, more consistent and convenient – working any place you have drinking water and a container. Tablets are an effective way to get good molecular hydrogen saturation – IF you have done everything correctly. There is no doubt they are an excellent way to get the benefits of molecular hydrogen H2 when you are traveling. Overall they are easy to use, very affordable, portable, and – if used properly – consistently produce a high saturation of molecular hydrogen H2 water. After waiting a while, and if you’ve done everything correctly, you will have molecular hydrogen H2 dissolved in water. One issue with the sticks is they do not filter the water. Many manufacturers recommend they be used with bottled water only. At a minimum, you should be using properly filtered water. Also, while they will produce varying levels of molecular hydrogen H2 saturation when new, molecular hydrogen water generating sticks are not as convenient as an electric water ionizer. You have to wait for the chemical reaction to take place in a limited amount of water. Worse, there is no consistency in how long it takes to create the molecular hydrogen H2. Plus there is no data on how long a magnesium stick is capable of producing significant amounts of molecular hydrogen H2. The bottom line is that they work – with some important caveats. Join the molecular hydrogen H2 water revolution and optimize your health and well-being! Experience more energy and mental clarity plus improve your athletic performance by giving your body the ability to naturally thrive. You have the best products to choose from at AlkaViva – we’ll help you find the right one for your budget and lifestyle! 1.) ZHANG, J. Y., LIU, C., ZHOU, L., QU, K., WANG, R. T., TAI, M. H., LEI, J. C. W. L., WU, Q. F. and WANG, Z. X. (2012). A Review of Hydrogen as a New Medical Therapy. Hepato-Gastroenterology 59, 1026-1032. 2.) SHIRAHATA, S. A. N. E. T. A. K. A. (2002). Reduced water for prevention of diseases. Animal Cell Technology: Basic and Applied Aspects 12, 25-30. 3.) SHIRAHATA, S., HAMASAKI, T. and TERUYA, K. (2012). Advanced research on the health benefit of reduced water. Trends in Food Science and Technology 23, 124-131.